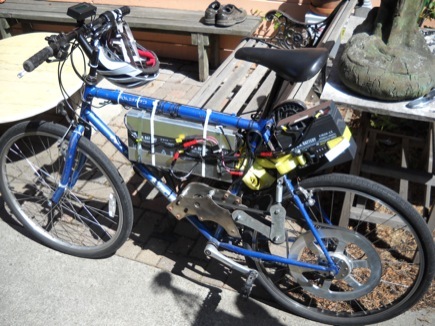 In an impulsive move the day before the Refuel event at Laguna Seca back on June 26th, I decided to add another 20AH SLA battery to the Poly-V bike, and swap the controller out for an Ebikes.ca “40 A Infineon” controller I bought a while back for another bike. I was curious to see how it would ride on 36 volts, I thought it might be fun. 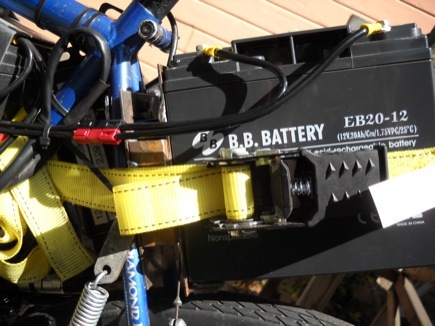 After wiring up my throttle and hall sensors to the Hi-Kol motor and Magura throttle on the bike I tested the controller with the third battery in a backpack, after proving that it worked I set about mounting yet another lead brick on the frame. It’s quite rigid and sturdy. 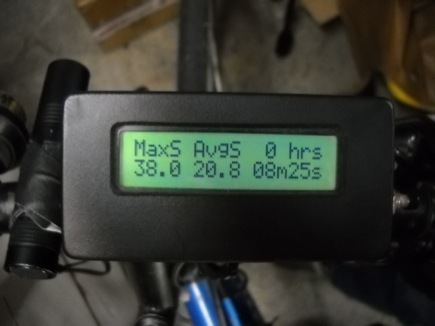 I hadn’t ever used a china BLDC ebike controller (Infineon, crystalyte, etc) before so I didn’t know what to expect- it’s pretty straightforward and worked fine out of the box. 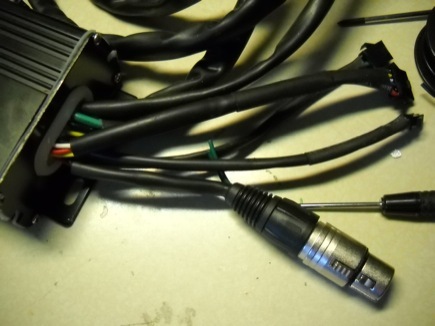 I got lucky and got my commutation sensor connections right on the first try- I made a small adapter to connect the JST connector on the controller to the Minifit Jr connector I have on the Hi-Kol motor. 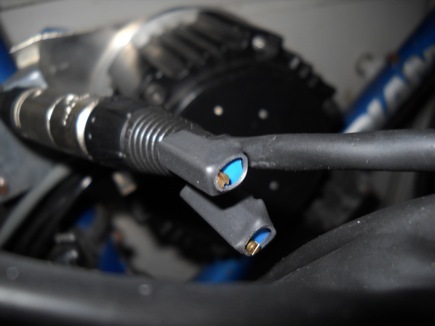 I installed a 3 pin XLR connector on the throttle connection to match the hardware on the bike. I don’t really like the feel of the JST connectors. I figure it’s worth a few dollars to run nicer connectors. The Magura throttle is a 5k potentiometer type throttle and the controller is set up to run a 1-4V hall throttle- unfortunately the controller was also programmed to cut out entirely when a throttle signal much higher than 4V is applied, which causes an annoying dead spot at the top of the throttle. 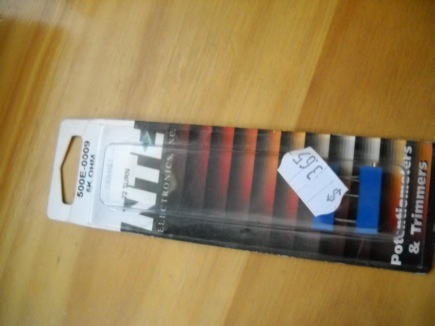 I solved this problem, along with the large dead spot at the bottom of the throttle by applying a 5k 10 turn potentiometer in series with the top and bottom throttle taps. The good news is that the bike is significantly faster and fun to ride- it hauls at about 26 on the flat with no pedaling, as opposed to about 19 before. The bad news is that it’s even heavier and significantly less efficient. Back EMF used to limit the top speed nicely to about 20, pulling only about 300-400 watts cruising at that speed (somewhere around 20 wh/mi). While the current begins to taper back at steady state full throttle cruising with this new setup it’s not as much- it draws about 800 watts now. This of course destroys the wh/mi figure, as well as compounding battery sag and peukert effects. So basically, it’s pretty much ruined. But faster. 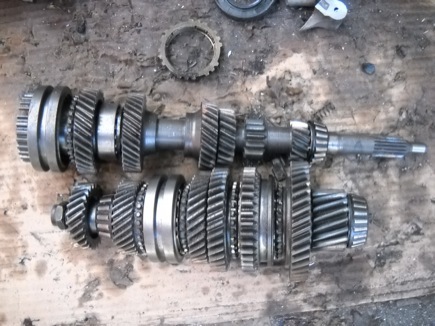 In other news I took apart a small 5spd transaxle this morning, because I had it and I was curious- I am also interested in the fesability of using a couple of the gear clusters to make a two or three speed box for a electric mega-bicycle or something. For now I will just hold onto these parts and think about it a bit. While starting with these parts should be easier than cutting helical gears from scratch for a gearbox it most definitely won’t be easy to build something up. Taking stuff apart is always fun if for nothing else to admire the engineering that went in to it.